I strongly believe that art and creativity have an incredible therapeutic aspect. Most people who saw me depressed advised me to talk to a therapist, but I knew it wouldn’t work for me because I cannot talk about my feelings to a stranger for money. Art has a soothing quality that eased my mind and allowed me to process my feelings and moods. So, instead of talking I chose to write, and instead of a therapist I chose a journal. The words came out as fast and easily as the tears flooding my eyes on those dark days. I chose writing because writing is what I do, but I think painting or photography or any other form of art can have the same therapeutic effect. What I like with writing is—and this might sound ridiculously obvious—that it’s about words. Words have a performative power and can create important meaning if you’re willing to play with them. Writing about my emotions helped me understand them better. Putting words on paper forced me to take the time to stop and think about what was going on in my mind and my heart. I needed to get those dark thoughts off my chest, and writing has this story-telling quality which makes it easier to take a step back and detach myself from my feelings. Contrary to speech, writing is a way to talk without being interrupted or corrected or judged by an interlocutor. No one can stop me from expressing what I need to express. And even if readers choose to close the book, I will already have written all those words and they cannot take them away from me. I can also use whatever images and harsh words I want to describe my feelings without having to see the shocked expression of a listener. Depression made it into most of my poems under different themes. A lot of poems are about my friends and lovers. Other texts evoke my identity struggles, with issues of gender and mental health for instance. Some poems also describe my desire of traveling and leaving home for a while. These broad topics can of course be interpreted in various and contradictory ways. My needy poems inspired and implicitly dedicated to my male friends will often be read as romantic love declarations. The texts about my struggles with my own sense of self might be read as politically engaged and deconstructing societal issues. And my urge to leave and forget may look like a desire to travel around the world. The different interpretations that my poems get helps me to let go of the intense and sometimes painful emotions which inspired them. Depression seems thus less present as it fades and even disappears under the eyes of some of my readers. The positive readings of my words lessen the control that depression has over my mind. Sharing my poetry therefore contributes to the therapeutic aspect of my writing. How do I live through them? 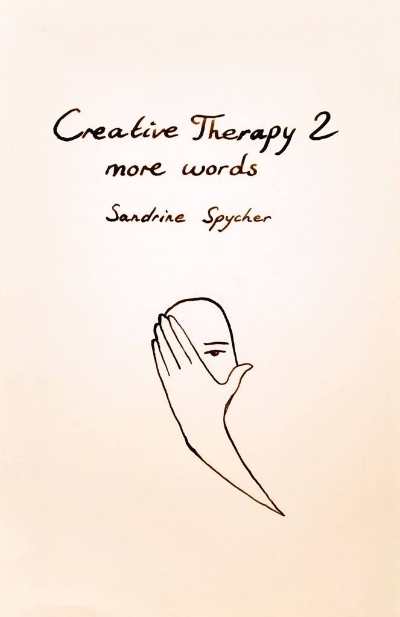 Writing Creative Therapy 2 allowed me to make sense of my emotions in poems of various forms. Working on my words helped me to distance myself from my depression. And the positive reactions to the different colors of my poems allows me to let go of dark thoughts. The book will come out both in paperback and digital format, with a short biography by my friend Jude Sirbu and a couple of illustrations by myself.